Susanna Moodie: Roughing It in the Bush achieves its goal of reclaiming a Canadian pioneer story. 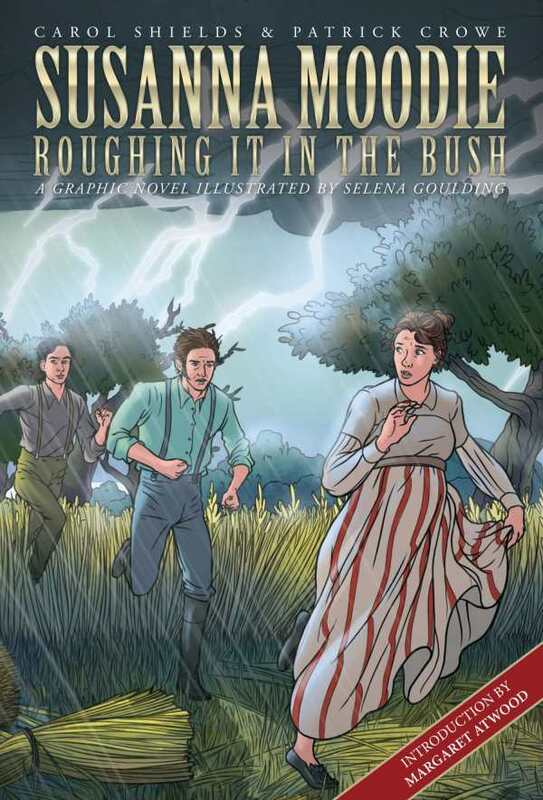 Roughing It in the Bush, Susanna Moodie’s original, autobiographical account of her years living in the Canadian wilderness, is considered by some to be the Canadian equivalent of Laura Ingalls Wilder’s Little House series, while others deem it to be overly dense or even somewhat anti-Canadian in the British-born Moodie’s sometimes harsh criticisms. Patrick Crowe and the late Carol Shields both had long connections with Moodie and her book, with Crowe spearheading a documentary film, The Enduring Enigma of Susanna Moodie, and Shields writing her master’s thesis on the subject. In this graphic novel, the pair have smoothed the rough edges from Moodie’s story, without losing any of its impact. This is no whitewashing of history; in the graphic novel, a despairing Moodie is often shown regretting her decisions, and the harsh frontier life is shown with all its hardships. Shields and Crowe give context for Moodie’s struggles by beginning the graphic novel with Moodie’s life in England and the events that brought her to Canada; similarly, an epilogue gives a glimpse of her post-wilderness life, and the strange kind of fame it brought her. Selena Goulding’s art is clean and efficient, perfect for telling the tale visually without distracting from it. With an introduction by Margaret Atwood, author of the poem sequence The Journals of Susanna Moodie, this graphic novel illuminates the figure of Susanna Moodie by shining a wider, brighter light on her story without losing the essence of what made Moodie’s original accounts so compelling.